If you’re planning on taking a voyage on rough seas, you’ll need luggage that can withstand being tossed around. 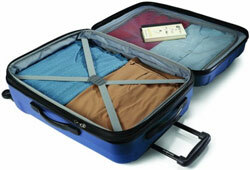 Canvas or other flexible exterior suitcases probably won’t cut it when you’re on the high seas. Obviously this isn’t a situation that’s going to happen to most people who travel, but a bit of turbulence on a plane is all you need to damage the possessions you have in an overhead compartment. I don’t even want to think about how things start flying around in the checked baggage area! The Samsonite Luggage Fiero HS Spinner is a mid-priced case that offers a heck of a lot of protection, and the size of the 20-inch is small enough for an overhead compartment. Space isn’t a worry either because this case has “oodles” of it! When I was younger, I travelled often with some semi-important “hardware” I wanted to keep safe. I would fly to tournaments in high school and come back with fragile trophies, and I had more than one end up shattered after a rough flight or because of an overzealous baggage handler (or two). I think this case would have been enough to keep them safe (if it had been around then). Actually, I’m trying to think of something that wouldn’t be kept safe in a case with this kind of structural integrity. The outside is made of 100% polycarbonate, so it’s very hard and not at all flexible. It’s also designed with an exterior that can withstand some serious tossing around. The exterior was created with a micro-diamond texture so surface scratches are a thing of the past with this piece of luggage. If you’re going to be in a situation where you could get caught in a rainstorm or snow, you want something like the Fiero HS Spinner 20 because it’s designed to take what the weather has to throw at you. It’s probably not a good idea to submerge it in the ocean, but you shouldn’t have problems with wet clothes or electronics if you’re caught in bad weather. Fiero also comes in multiple sizes including the carry-on 20-inch as well as the 24 and 28-inch that have to be checked if you’re flying. While the black case is unimposing and looks like “business as usual”, Fiero comes in several different colors that definitely break the typical business mold. Choose from classic black or muted gray if you’re trying to stay understated. Otherwise, break out of the mold and go full on flash with eye-catching blue or purple. Bright colors may seem more like a fashion statement, but they also address a security issue. There won’t be any problem finding your bags in the last two hues, and the chance of anyone else sporting a case with that much character is pretty slim. Also, you don’t have to worry about someone walking off with your bag should you have to collect it at baggage claim. The hard exterior shell seems to be a slight problem for many air travelers, though. Canvas and leather bags offer a little bit of flexibility so you can retrieve things without opening the entire case. This one on the other hand, doesn’t have that option because the exterior is designed to be as inflexible as possible. 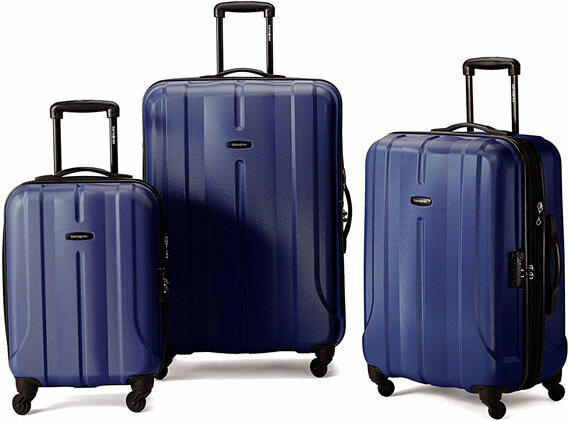 It has the features many good suitcases have which include spinning wheels, pockets galore and straps that help make sure your stuff is secured beneath the impressive shell. If security is a concern, there is a TSA-approved lock that keeps unwanted hands out of your stuff without violating any laws or regulations. At around $115.00, The Fiero HS Spinner 20 is not the cheapest option out there, but it also isn’t the most expensive. OK, so the 20-inch won’t support the amount of stuff you need for a 3 month vacation, but it can handle more than just a day or two’s worth of clothes. Plus, it’ sturdy, has no reported problems with the zipper (unlike many other products I’ve come across) and looks really good no matter what color you choose.